Greater Portland Maine & Casco Bay, Maine’s largest metropolitan area, offers an eclectic mix of big city culture with New England charm. 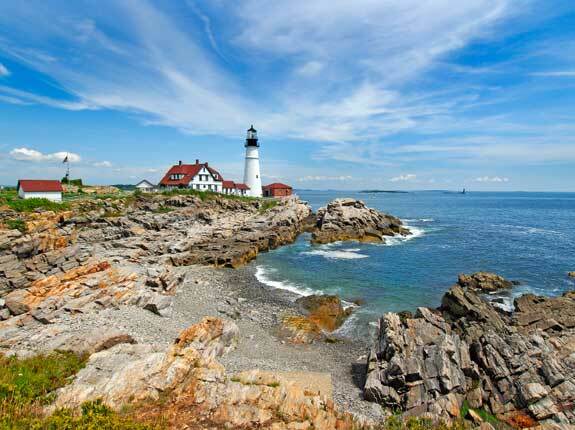 From Portland Head Light, Maine’s most recognized historic site, to the shops of Freeport, home of L.L. Bean, the region offers something for everyone. Sandy beaches are numerous, as are the many water sports available to the visitor, including sailing, sea kayaking, and ferry and sightseeing cruises. Cultural attractions feature the Portland Museum of Art, Portland Symphony Orchestra, and the Portland Ballet Company. Maine Event highlights feature the Maine State Music Festival, Yarmouth Clam Festival, Maine Highland Games, Tuna Tournament, and Cumberland Fair. To see a map of Cumberland County and all towns and cities in the county, please click here. Other towns of interest include: Chebeague Island, Cliff Island, Cumberland Center, Falmouth Foreside, Freeport, Frye Island, Gray, Harpswell, Raymond, and Yarmouth. * Population figures are based on 2010 Maine census estimates. Portland, Maine: January: 30.3 to 11.4, April: 52.3 to 34.1, July: 78.8 to 58.3, October: 58.7 to 38.3. Maine’s largest city, Portland, sits on the shores of Casco Bay. Hundreds of islands dot this very large, scenic bay. Scarborough: Artist Winslow Homer’s studio. Biking, Hiking, Golf, Swimming, Boating & Sailing, Canoeing & Kayaking, Freshwater and Saltwater Fishing, Downhill & Cross Country Skiing. See Sports & Recreation for related listings and detailed information.